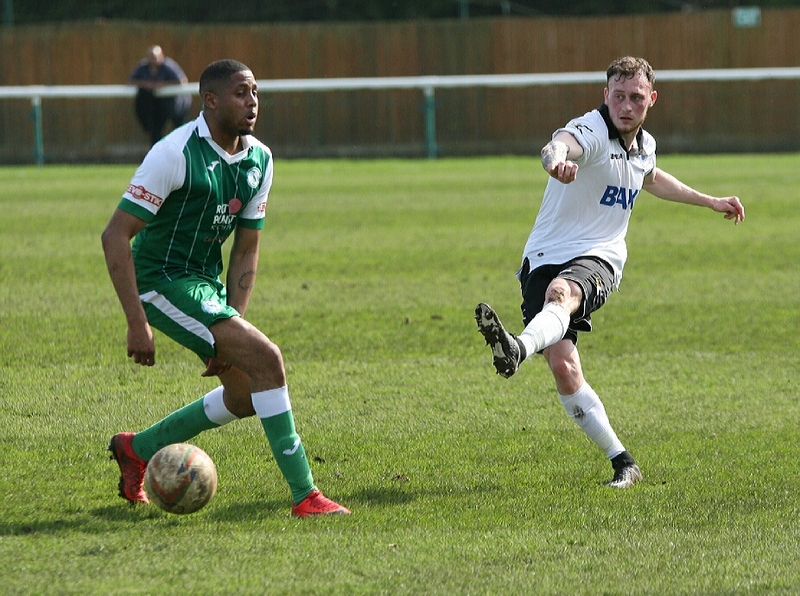 Town suffered another disappointing defeat at Biggleswade Town. A goal down at half time Ben Stephens equalised early in the 2nd half from the penalty spot. But they fell away badly in the last 20 minutes and conceded 2 goals in a 3 minute spell. Town had an attacking look to it with Taylor, Luckie, Ahenkorah and Stephens all starting. Biggleswade continued with midfield player Craig Daniel in goal as they had no fit Keeper available. The game started in bright sunshine with both sides pushing forward but it was Connor who was called into action first when a low cross from the right deflected off a Town defender and made a good reaction save at the near post. But Town started to make inroads into the Waders box. Stephens had a header easily collected by Daniel followed by a thumping volley which looked goal bound but hit a defender and was scrambled clear. Bigleswade enjoyed a good spell of pressure forcing a succession of corners before Connor made an excellent point blank save from Bowen's bullet header. Then it was the turn of Daniels in the Waders goal to deny Stephens with a brilliant save. But Town fell behind in the 42nd minute when Baileys cross from the left was met at the near post by Jack Bowen was forced home at the second attempt. Town applied some early pressure as the 2nd half started and got back into the game when Jaz Luckie burst into the box and was brought down by Burnett. Ben Stephens stepped up and made no mistake with the spot kick. After the equaliser there were periods of scrappy play from both sides but gradually Biggleswade started to get on top. Town replaced Taylor and Ahenkorah with Evans and Fry. With Town looking tired they seemed to lack any threat up front and on 72 minutes Bowen slid a perfect pass through to Bailey who turned in the box and confidently fired it into the far corner. Three minutes later it became 3-1 when Connor made an excellent save from a Bowen shot only for Griffiths to react the quickest and fire home with his first touch after coming off the bench 2 minutes earlier. By now the home side created several chances and Connor made a couple more excellent saves and Bowen was denied when his shot cannoned off the post. Town will need to re-group in preparation for another away game on Tuesday night at St Ives. Both Andy Gallinagh and James Fry picked up injuries late on and may be doubtful for the trip. Man of the match Louis Connor with a number of fine saves.